In recent full page newspaper ads, Sharp, the multinational electronics giant, touts the prediction that the 21st century is going to be “the solar century.” Consistent with its prediction, Sharp has also recently announced a large multibillion dollar investment in expanded solar panel manufacturing plant capacity. Regardless of the actual outcome of Sharp’s prediction, there is no question the solar sector is experiencing unprecedented growth. Tax and financial advisors interested in this expanding area should consider engaging in important preparatory tax planning, so their clients are thereby positioned to maximize the solar opportunity when ready. Many federal tax advisors are familiar with the 30% commercial building solar tax credit and the 5 year accelerated depreciation but are unaware of the substantial tax planning opportunities related to preparing for a solar project. The first section of this article describes the major categories of solar products and explains why, in the author’s opinion, this is indeed “the solar century.” The second section of this article focuses on the types of tax planning that will maximize the facilities solar opportunity, regardless of whether the facility chooses a solar product. The two major categories of building solar products are: solar photo voltaic (P.V.) and solar thermal. Solar P.V. products use solar rays to generate electricity. Solar thermal systems use solar rays to heat hot water. Solar Thermal products often have more favorable payback periods, meaning years to recoup the investment, and can provide substantial savings for facilities that need large quantities of hot water, including laundries, heated pools, and hospital facilities. When most Americans talk about solar, they mean solar P.V. The remainder of this article focuses on solar P.V. A forthcoming companion article will focus on the tax aspects of solar thermal. Solar P.V. generates extra electricity that can be used to provide electricity for the building or can be transferred to the electrical grid for use by others. The process of transferring solar electricity to the grid is sometimes called nega watts, or net metering. Solar P.V. has traditionally been quite expensive and the economic payback has been disappointingly unattractive, often exceeding seven years. Although many building owners intend to own a particular facility for more than seven years, at the front end of the decision seven years seems like a long time. Many business facilities won’t even look at a building energy reduction project unless it has a five year or less payback—and have clear preferences for projects with two to three year paybacks. It is the author’s opinion that there will be a huge increase in Solar P.V. installation resulting from a decline in the near-term future price of solar installations. Polysilicon is the core material for building PV panels. Globally, there are now more manufacturers able to produce polysilicon in much larger quantities. Many leading manufacturers historically focused on other industries are entering the solar industry, including DuPont and Intel. In addition to demonstrating that these companies believe in future solar opportunities, they bring unique expertise that improves the industry. Solar panel installers are becoming much more cost effective at installing rooftop P.V. Improved solar material is thinner and easier for installers to handle. Installers now use scanners that enable them to quickly locate the below roof rafters that panels are attached to. Also, installers can use enhanced computerized design tools to create drawings. The Lehman cost analysis did not cover reduced estimating costs, but the cost of estimating is decreasing since solar estimators can use Google earth to pre-qualify a solar roof project based on: roof size, southerly sun exposure, and sun obstruction. Using address zip codes, the solar project estimator can plug in the local utility electric rate and rebate scheme right into the cost estimation software. The energy cost savings from a P.V. installation is based on the existing electricity costs that can be eliminated and the revenues that can be earned from selling the excess electricity created. Calculating current electricity costs saves is straightforward calculation based on current electric charge rates. One challenge is that electricity costs continuously increase and forecasting future rates can be challenging. We have recently seen one year electricity costs as high as 70% in some jurisdictions which materially impacts the payback period. Utility rebates may or may not be available in a particular jurisdiction. Some states simply don’t offer solar rebates. Other jurisdictions may only offer rebates on first come first served basis pursuant to grants that sometimes run out of funding. Many companies use rigid capital authorization processes that will not allow for consideration related to investment approval unless the utility rebate is certain. Tax savings at federal and state and local level may or may not be available. As this article went to press Congress is currently considering various proposals that would extend the current solar and wind tax credits. The current federal 30% solar credit is scheduled to expire on December 31st 2008. Again, most companies will not consider tax opportunities in pay back models unless sustaining the tax benefits is probable. Renewable Energy Certificates (Green Tags) provide an economic incentive for the creation of renewable energy, as “the green energy generator is credited with one REC for every 1,000 kWh of electricity it creates.”3 For example, a company can accumulate RECs through the installation of solar P.V. panels, or any other use of alternative energy. These certificates may then be sold to purchasers with either voluntary or mandatory alternative energy usage commitments. One of the most important economic opportunities is net metering which enables the solar electricity generator to sell the extra electricity generator back into the grid at market or market plus rates. The attached chart (DSIRE) chart demonstrates that net metering is now available in 42 states and Washington D.C.
One of the first steps of a solar specifier takes is to analyze a building’s current energy use to prepare the economic payback proposal. A building should be made as energy efficient as possible before installing solar P.V., otherwise the extra electricity being generated by the P.V. system is simply being wasted and the amount of extra electricity available to sell into the grid for an enhanced economic return will be diminished. The most direct path to building energy reduction is to install an energy efficient lighting system and an energy efficient HVAC system. Energy efficient lighting may be eligible for immediate 60 cent per square foot EPAct tax deductions.5 Energy efficient lighting often provides a very lucrative economic payback period and that is sometimes sub two or even sub one year. 1. To obtain the electricity usage reduction related to the more efficient replacement equipment to enhance the benefit from the PV electrical generation and 2. To properly create the solar roof top layout since the panels must be designed to function around both the HVAC unit profile and the resultant shadows created by the HVAC equipment enclosure. One of the most common steps before installing rooftop P.V. is to replace the existing roof. Accordingly, building owners need to first analyze their roof replacement life cycle. Obviously it makes no sense to install solar panels on the top of roof that is nearing the end of its life cycle. The decision to install rooftop P.V. is an expensive decision often requiring extensive analysis. Before making the final decisions, preparatory energy equipment related tax planning can result in an enhanced economic return from the P.V. solar project. 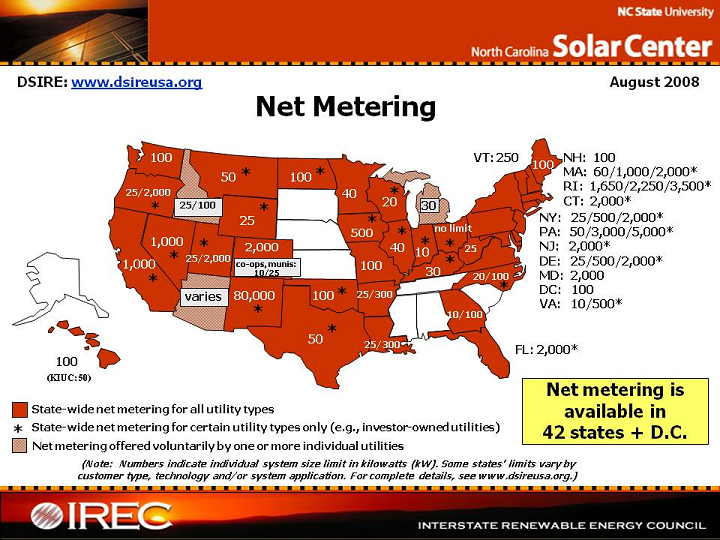 4 - “Net Metering.” Interstate Renewable Energy Council as presented by the Database of State Incentives for Renewables & Efficieny (www.dsire.org). 5 - Goulding, Charles, Jacob Goldman, and Siddarth Sheth. “Tax Deductions Brighten Lighting Upgrades.” Corporate Business Taxation Monthly. October 2007, p. 23-24, 36. 6 - Goulding, Charles, Jacob Goldman, and Nicole DiMarino. “The Tax Aspects of HVAC Package Unit Replacement Programs.” Corporate Business Taxation Monthly. July 2008, p. 19-20, 49-50.